SUMMARY: Seventeen-year old Cricket Thompson can hardly believe her luck when she gets a last-minute invitation to spend the summer with her best friend Jules and her family on beautiful Nantucket Island. Instead of babysitting all summer, Cricket will soak up some sun and attend beach parties with her best friend and maybe even Jay Logan, her longtime crush. But tragedy strikes, and Cricket's invitation is revoked. Disappointed, Cricket decides to go to Nantucket anyway--on her own. But when the job she secured falls through and Jules gives her the cold shoulder, Cricket must decide between going home and making the most of the situation. WHAT I LIKED: Summer, the beach, first love, best friend drama, a little family mystery...what's not to love? I read Nantucket Blue in one sitting. 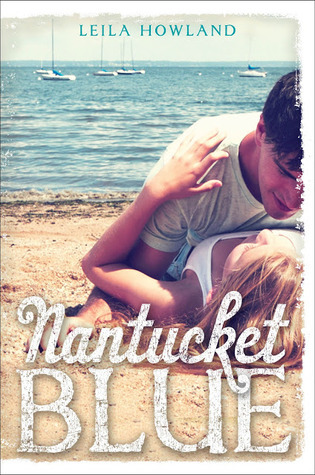 Nantucket Blue is very much a character-driven story; the characters are realistically-flawed and no one is perfect or always makes the right choices. I can understand why Jules is annoyed with Cricket--Cricket really is a smothering and needy friend. I got annoyed with her, also. Irritation does not justify Jules' bad behavior toward Cricket, but it's at least understandable. Cricket's obsession with Jay Logan is typical of a teen girl's infatuation with a boy she barely knows. It's silly and based on practically nothing, but again, it's realistic for her age. Zack, Jules' younger brother, handles tragedy much better than his sister does, and I really liked his character. Like Cricket and Jules, Zack is not overly perfect; for all his great qualities (he has tons of them), he can also be immature and pushy as well. Author Howland clearly knows Nantucket Island and its history; I really felt like I could see crystal blue ocean waves, the enormous summer estates, the little shops and boutiques that dot the downtown area. Howland also includes some Nantucket lore about a ghost girl and some political drama and an old lady who can't stand for teens to be on her land; I'd be surprised if Howland didn't live on Nantucket at some point or at least visit there often. I'd also be surprised if the ghost girl and the old lady weren't based on real people. Neither was really necessary to the story, but including them adds local flavor to the already vivid descriptions of this idyllic setting. WHAT I DIDN'T LIKE: There is a little twist that I saw coming very early in the story. It's a nice twist, but some will figure it out. Since the twist is only a minor subplot, predicting it shouldn't spoil the reader's fun. Also, I am not a feminist or anything, but some will say the story's events have double standards for men and women. A male character lost his virginity in eighth grade and seems almost proud of it, but a female character is given a derogatory name ("Nora the Whora", a name I saw in another book recently) because of rumors of promiscuity. No one in the story ever notices or comments on this. Also, the boys drink heavily and smoke marijuana and no one bats an eyelash. But when Jules gets drunk, it's messy and makes her look like a fool. It's not a huge deal to me--I thoroughly enjoyed the story and found both these pieces of the story quite realistic--but some will take issue that characters never even seem to notice this double standard. THE BOTTOM LINE: A fun summer romance, perfect for a day at the beach. STATUS IN MY LIBRARY: As much as I'd love to get it for my library, mature content in this one marks it as best for high school.